Viridis Design Studio provides innovative residential interior design services. Residential design involves distinctive design concepts solely for private residences. Viridis Design Studio has completed a multitude of residential projects over the last decade spanning nearly every design style. Homeowners choose Viridis Design Studio for their commanding grasp on exquisite design. Designers at the studio regularly attend industry trade shows staying abreast of new design concepts and changes in technology. Technology continues to yield new opportunities for design, both in terms of innovation and budgets. Homeowners today have more access to high tech materials and in-home systems than ever before. But they wouldn’t know about them without a designer that assiduously studies the industry – a job that Viridis Design Studio performs impeccably well. Kick-off meeting to discuss homeowner needs and wants. We start the design process with a conversation about the homeowner’s ultimate desires. We look at design concepts and inspiration boards to draw ideas together and to get an idea of what the client is looking for. Establish the budget. We determine a budget for the project, which helps to narrow down what the priorities are for the homeowner. We can usually save money by using budget-friendly materials that still look expensive. Our connections with suppliers in the industry give us access to innovative solutions. Plan the project. Design is more than simply selecting finishes and paint color. Sometimes we need the opinion of a structural engineer if we are moving walls. We need licensed contractors for plumbing work and other jobs that create more than dust. We assemble the right team and seek the advice of skilled professionals to ensure a flawless project completion. Create the design. Once we understand the client’s needs, identify the design opportunities of the space, and determine what we can realistically accomplish within the budget, we work with the homeowner to develop a design that reflects their style and meets the needs of the residences occupying the space. Execute the project plan. Timing is everything when it comes to executing a design project effectively. Materials delivered at the wrong time can delay the progress of a project. Viridis Design Studio scrupulously oversees project milestones and orders to ensure the right materials in precise quantities are delivered at the correct time. Keeping the client informed. Viridis Design Studio communicates regularly with homeowners involving clients throughout the entire project. This ensures that any changes during the project call on the clients make the final decisions. Also, if the client decides on a new direction with any part of the process, they have a clear communication line with the lead designer so that adjustments can be made quickly. Viridis Design Studio may manage the entire transformation of a client’s domestic space or help a building contractor create a new-build home from scratch. But if your project requires the guidance of an interior designer for a specific portion of your project, here are examples of areas where we are able to assist. Selecting finishes such as flooring, cabinetry, counters, back splashes, wall textiles, appliances, lighting, acoustics, bathroom amenities, and more. Color palette selection. Create consistency in materials and colors. In-home spa or wet room. One of the hottest luxuries today in home design is a deluxe personal spa. View our Bathroom Design page for more information on creating an in-home spa. Custom wine cellar and tasting room. Looking to boost the high-end appeal of your home? A temperate wine cellar and tasting room will add sophistication to any residence. Outdoor living spaces. Creating an outdoor living space that includes a full kitchen may involve selecting stone finishes, appliances, designing the layout, architectural details, water and fire features, and more. Technology and media center. A separate entertainment room for the family and guests, a media room may include a full screen, surround sound acoustics, theater seating, dimmed lighting, a wet bar, and custom-crafted paneling for built-in amenities. Custom elements for your home that fit both its style and your own. Be the only one with these unique pieces or be the start of a new trend. Some of these elements or features include: tables, beds, lighting, display panels, and more. Open entertaining kitchen. As the epicenter for social gathering in the home and for family interaction, the kitchen is often the most important room of the home. See our Kitchen Design services for more information. Expanded great rooms. Following the kitchen, great rooms provide a social gathering space for guests and family members. These areas combine living, dining, and kitchen areas and often display custom finishes and unique features. Exterior finishes and colors. The exterior design of a home may involve selecting stones, materials for walkways, stucco, outdoor lighting, garage and exterior doors, garage pad paving, and overall color scheme. 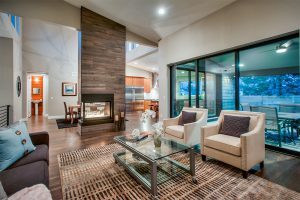 In this Transitional/Modern home, the center Fireplace divides the living room and dining room and extends to the vaulted ceiling. See our photo gallery for residential design ideas. To schedule a consultation or to discuss your residential design project, please contact us by phone at (303) 489-9958, or fill out our online contact form. Our designers are eager to work with you.